As part of an Advocacy Project for their practicum class, ECE students, under the direction of the ECE instructors, constructed and distributed flyers, assisted with logistics, and manned registration. It was a day of learning, fun, and networking with donations of morning refreshments and hand decorated bags with books and “goodies” as door prizes. Haʻakūmalae is the official orchestration of the Hawaiʻ i protocols leadership at Hawaiʻ i Community College and the University of Hawaiʻ i at Hilo. 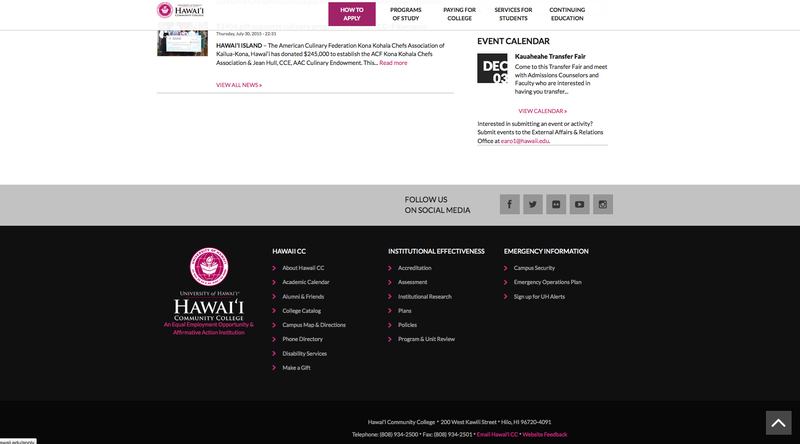 As an active member at our Hawaiʻi Community College and in the Hawaiʻi Island Community there are many opportunities and events for engagement in these activities. A kīpaepea for the welcoming of Waiariki Institute of Technology was held on Wednesday, November 4th, 2015. Representatives of three of their programs visited our campus. Their visit is part of an exchange between colleges involving participants of the Wo Global Learning Champions cohort. In honor of the 75th Anniversary of Hawaiʻi Community College the annual Alumni dinner recognized the achievements and liestones of the college from the years past. The dinner began with a kīpaepae welina and included a hōʻike featuring Unukupukupu. Haʻakūmalae participation in this event included Faculty & Staff of both campuses (HawCC & UHH) as well as current & former students of the Hawaiʻi Life Styles Hula program. The International Congress on Coastal and Marine Tourism (CMT) returned to Hawaii 25 years after its inaugural meeting there in 1990. Unukupukupu was invited to present the opening protocols for this event, a kīpaepae welina was presented to establish the foundation for all organizations and participants attending. 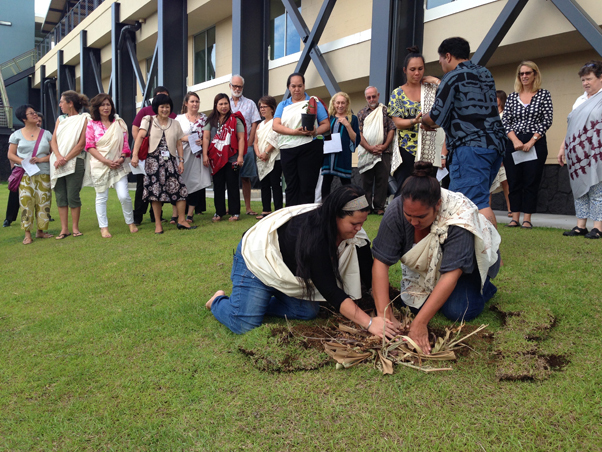 This annual Hōʻike of West Hawaiʻi was held for the first time at the Pālamanui campus. This is an event that encourages campus wide participation in the demonstration of semester learning as shared by and with the faculty, staff, students, programs, families & community of Pālamanui. 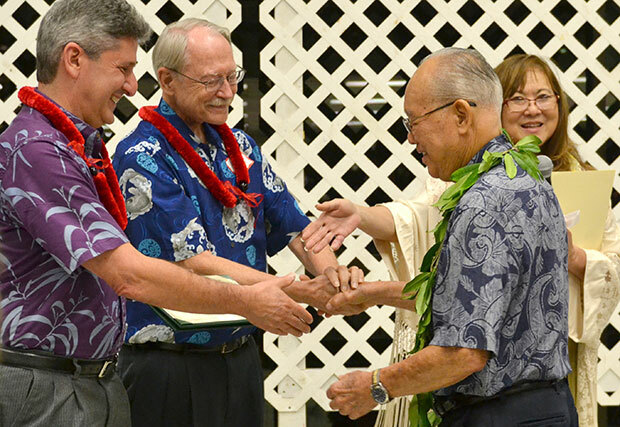 This occasion honored the contributions of both Rockne Freitas (Retired Chancellor of UH West Oahu) and NoreenYamane (Retired Chancellor of Hawaiʻi Community College) to the UH System. The celebration honored them with lei, food, music, hula, and many well wishers. As a culmination of the Fall semester the Hawaiʻi Life Styles (HLS) Program hosted it’s annual Fall Hōʻike for their students enrolled in the HLS courses. This opportunity is presented for students to gather and share their learning with family, friends, faculty, & staff. This year’s Hō’ike was held on Thursday, December 10th, 2015. This annual tradition recognizes the new hires of HawCC as recognized at the start of the semester at the All College meeting. The President’s Emerging Leaders Program is a professional development opportunity for highly motivated faculty and staff of the University of Hawai‘i that identifies and develops future campus and system leaders. This group of 25 individuals visited the University of Hawaiʻi at Hilo and Hawaiʻi Community College. This program will assist participants in establishing a base of knowledge about higher education, and in addition, offer potential leaders a chance to reflect upon their leadership potential and how they might make a difference in our campuses and system. As a continuation of the PELP experience at HawCC, some of the Wahi Pana of Hilo were shared with the group as connected to the development of leadership, inquiry & innovation through one of the many moʻolelo of Maui. A kīpaepae for the welcoming of Pressident Lassiner’s Hawaiʻi Papa O Ke Ao Task Force to Hawaiʻi Community College – Hilo, HI. Their visit was part of weekend retreat coordinated to address the ongoing initiative of developing a plan to make the University of Hawaiʻi a leader in indigenous education. In recognition of the ongoing sister city relations of Yurihama (Tottori Prefecture, Japan) & Hilo, this occasion celebrated the arrival of Yurihama town mayor and his associates as they visited Hilo to build, strengthen, and reaffirm our sister city commitment. a spirit and promises a continuous commitment to the community. This ceremony officially acknowledged the Pālamanui campus as a new home for the faculty, staff, and community of West Hawaiʻi. This ceremony helped to affirm the dedication of our college to our communities and acknowledged the celebration of the opening of these new buildings and the enlightenment they will bestow upon all. The time has arrived for the creation of the kāhili in honor of our college’s 75th Anniversary. In recognition of all past, present, & future endeavors we invite you, our Kauhale community, to contribute to the formation of this momentous occasion. 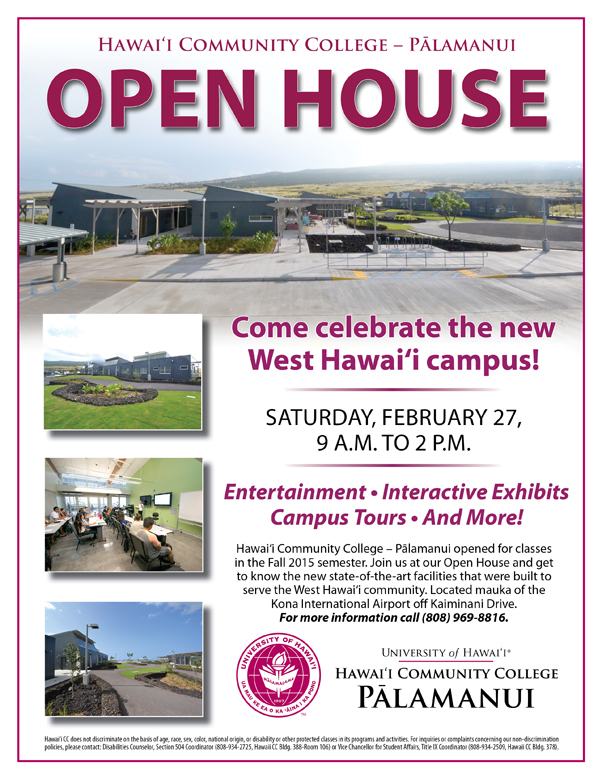 All are welcome – HawaiiCC Faculty, Staff, Students & Family members! This ongoing process will culminate in a completed kāhili to be utilized during the HawCC participation in Merrie Monarch 2016, Commencement and future occasions honoring our college and community. Haʻakūmalae refers to the process of engagement of our faculty, staff, student & community thru shared experiences that are created to be inclusive, informative, inspirational, and applicable. This workshop introduced several active experiences of Haʻakūmalae and provided a hands on opportunity to participate in an engagement activity while creating active dialogue for community & cultural integration. There will be a kīpaepae for the welcoming of 8 students and two professors from the Hiroshima University of Economics (HUE). During their time on our campus, they will visit Culinary classes and participate in cultural exchanges with HawCC students. We warmly invite you to participate in a Kipaepae Welina on Wednesday – March 16, 2016 for the welcoming of the Univeristy of Hawai’i Upward Bound Program. A group of 30+ High School students and 2 chaperones will be visiting our campus and experienceing the different programs and offices of our campus. Pāmaomao is an active commitment to a protocols based travel experience thru connections with indigenous cultures by way of the Hawaiʻi protocols traditions of community spiritual bridging. A group of faculty, staff, and students will be making the journey to Montana over Spring Break to participate in an indigenous community cultural exchange as facilitated with tribal colleges of the area. This travel consists of 24 participants – Faculty, Staff and Students, from Hawaiʻi Community College and University of Hawaiʻi at Hilo. Haʻakūmalae participation at events in this year’s Merrie Monarch Festival includes the opening ceremony in the morning on March 27th at Afook Chinen Civic center; an Unukupukupu hula performance in the afternoon at the Naniloa Hotel; participation in ‘Imiloa discussion sessions; volunteer ushering at the Edith Kanaka’ole Multipurpose Stadium; the Merrie Monarch Parade on Saturday, April 2nd; and cultural & economical support of vendors, dancers and hālau. Join us at 8:30am at the Kamehameha Statue and MARCH with the college in the Merrie Monarch Parade. Represent HawCC and wear your shirts: White, Maroon, or Black…Club shirt, College shirt/polo, or Program shirt!!! Join us from 1pm-3pm right after the Merrie Monarch parade at Wailoa State Park – Large Pavilion! GAMES, FOOD, MUSIC & FUN!!!! Bring your family, bring your lunch, order a bento and enjoy our HawCC Kauhale in its true state of family oriented fun and camaraderie. For additional information regarding Haʻakūmalae activities, please contact Uluwehi (Jacqueline Van Blarcom) at blarcom@hawaii.edu. University of Hawai‘i at Hilo Chancellor Don Straney and Hawai‘i Community College Interim Chancellor Joni Onishi jointly announced today the appointment of Taupōuri Tangarō, PhD, as director of Hawaiian culture and protocols engagement for both campuses. “The appointment of Dr. Tangarō to this important collaborative position shows the joint commitment of UH Hilo and Hawai‘i Community College to Hawai‘i Papa O Ke Ao, the systemwide plan for UH to become a model indigenous-serving institution,” said Straney. Tangarō served on the UH System taskforce that developed the plan in 2012 and currently serves as a member of the systemwide Hawaii Papa O Ke Ao Committee. “Dr. Tangarō is well qualified to advise the leadership of UH Hilo and Hawaii Community College on implementing our respective Hawaii Papa O Ke Ao plans and collaborating on goals and objectives that benefit both campuses,” said Onishi. Tangarō received his bachelor of arts in Hawaiian studies from UH Hilo, his master in education from Heritage College at Toppenish, Washington state, and his doctor of philosophy in interdisciplinary studies from Union Institute and University, Ohio. He graduated as a hula instructor, with the title Uniki Kumu Hula, from Halau O Kekuhi in 2007. He is a professor of Hawaiian studies at Hawaii CC and delivers the associate of arts degree in Hawaiian studies with a hula focus. By using the halau (formal Hawaiian education) foundation to teach the hula degree program, he established Unukupukupu, the halau hula of Hawai‘i CC, over ten years ago. Tangarō and Unukupkupu have performed worldwide including at the 2012 Smithsonian Folklife Festival in Washington, DC; the 2012 International Union for the Conservation of Nature Congress in Jeju, Korea; and at the World of Shadow Theatre in Stuttgart, Germany, this past December. Tangarō serves as director of the Kauhale Academic Village, described as an ‘ohana (family) of administrators, faculty, staff, students, their families, and the Hawai‘i Island community that contributes measurably to the success of Hawai‘i CC’s mission and outcomes. In collaborative initiatives between Hawai‘i CC and UH Hilo, Tangarō is founder and director of the Unuolehua Academic Success via Kumu Hula Program, the Kīpaepae Hawai‘i Protocols Committee, the Haʻakūmalae-Hawai‘i Protocols Training, the Kukuena Hula cohort of Hawai‘i CC and UH Hilo to increase transfer students, and the Unuiti hula program to introduce K-12 grades to Hawai‘i CC and UH Hilo. He is co-founder and director of Hawaii Pāmaomao Indigenous Exchange and Engagement Program, and co-founder and co-director of the Uluakea Indigenizing Academic Process and Services of UH Hilo with Gail Makuakāne-Lundin, Director of Kīpuka Native Hawaiian Student Center and Interim Vice Chancellor for Student Affairs. Tangarō received the Native Hawaiian Education Association Educator of the Year in 2013, the UH Board of Regents Excellence in Teaching Award in 2010, the UH Frances Davis Award for Excellence in Undergraduate Teaching in 2010, and the UH Hilo Distinguished Service Award in 2006. The Pālamanui Open House is set for Saturday, February 27 from 9 a.m. to 2 p.m. Stay tuned for more specifics on performers and other details of the event! Hawai’i Community College Fire Science students and instructors from the Fire Science and Diesel Mechanics programs stand with the fire engine donated recently by the Honolulu Fire Department. Back row: Matthew Winters, left, and Jacob Smith. Front row, left to right: Fire Science Instructor Jack Minassian, Kawai Ronia, Jayce Ah Heong, Michael Rangasan, and Diesel Mechanics Instructor Mitchell Soares. Students in the Fire Science and Diesel Mechanics programs at Hawai‘i Community College (Hawai‘i CC) will have new opportunities for hands-on learning thanks to the generosity of the Honolulu Fire Department (HFD) and Young Brothers, Limited. 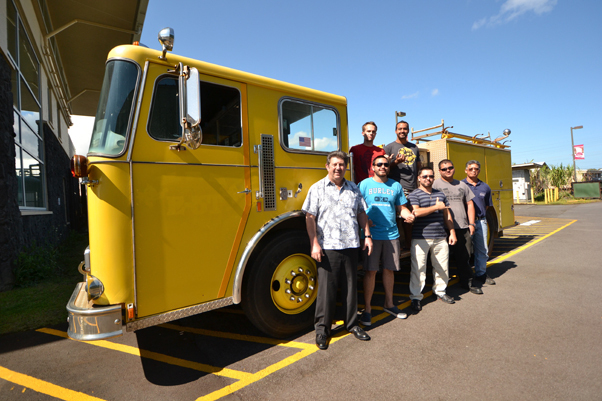 HFD has donated a surplus Type I fire engine that previously served the Pearl City community on O‘ahu. Now the engine will serve Hawai‘i Community College students, who will be able to use it during their coursework. Hawai‘i CC began offering Fire Science classes in 2005, and the University of Hawai‘i Board of Regents granted the program permanent status in 2013. Since then Fire Science has become one of the most popular programs at the college. There are 102 students currently majoring in Fire Science. Hawai‘i CC Fire Science graduates have found employment with federal, state and local fire service agencies, said Minassian. In addition, the college has a transfer agreement with Colorado State University (CSU) that allows Hawai‘i CC Fire Science graduates to easily enter CSU’s online Bachelor of Science in Fire and Emergency Services Administration program. Students can complete the online Bachelor of Science program while living on Hawai‘i Island. Two Hawai‘i CC graduates have obtained their Bachelor of Science degrees through this program, and six are currently enrolled, said Minassian. Diesel Mechanics students will provide upkeep and maintenance of the fire engine. HFD also donated a similar engine to Honolulu Community College. Hawai‘i Community College will host an Express Admissions Day on Saturday, January 30 from 9 a.m. to 1 p.m. at the Manono Campus in Hilo. Express Admissions Day is the fast and easy way to apply for the Fall 2016 semester. Prospective students can complete an application; receive their MyUH Student Number; learn about financial aid; schedule the next steps in the enrollment process, such as academic advising, orientation and placement testing; and have their questions answered by Hawai‘i CC representatives. For more information about Express Admissions Day, please call the Hawai‘i CC Information Center at (808) 934-2800. Members of the Hawaiʻi Community College and University of Hawaiʻi ʻohana celebrated the retirement of Chancellor Noreen Yamane and former Chancellor Rockne Freitas on Friday, December 4 with a Pāʻina Aloha. The event took place at Papaʻa Hale and Kapakapakaua Malae on the Manono Campus. Chef Okuda and the culinary students prepared a Hawaiian dinner with Kalua-style Pig, Laulau, Lomi Salmon, Chicken Long Rice, Poi and all the extra dishes. Entertainment featured Hawai’i CC homegrown talent. Mahalo to Rockne and Noreen for their many years of service to the college and the university system! More than 170 students, faculty, and staff attended the Fall ʻĀina Student Showcase in the cafeteria on December 3rd. The event included student displays, presentations, and videos emphasizing the theme of ʻĀina (land). Participating classes include History 151 & 152, Philosophy 120W, English 100 & Geography 122 Learning Community, Hawaiʻi Stewardship: Protocols 260, and Human Services 110. If you would like your students to participate in the Spring ʻĀina Showcase or are interested in learning more, please email Sam Giordanengo at samuelg@hawaii.edu or Monica Burnett at mburnett@hawaii.edu. Hawai‘i Community College students who are studying global positioning systems (GPS) and geographic information systems (GIS) recently used their technology skills to help preserve part of an ancient Native Hawaiian trail. The trail ­— which features petroglyphs, caves, and ancient lama trees — is next to the new Hawai‘i Community College – Pālamanui campus in Kona. Until recently the trail was overgrown with invasive fountain grass and forgotten. Since June 2014, trail expert and Hawai‘i CC – Pālamanui humanities lecturer Dr. Richard Stevens has been leading an effort to restore the mauka-to-makai pathway. Many students and community volunteers have ripped out fountain grass and moved rocks to help reclaim the trail from nature. Now the goal is to keep track of the trail, and that’s where the students enrolled in Introduction to GIS and GPS come in. On a hot Saturday morning on November 14, 2015, the Hawai‘i CC students used their handheld GPS devices to mark significant locations along the trail, including the petroglyphs and caves. The Introduction to GIS and GPS course is one of four classes Hawai‘i CC students take in order to earn a certificate in Geospatial Technology. The courses and the certificate are part of the Architectural, Engineering and CAD Technologies program at Hawai‘i CC, which offers three certificates and an Associate in Applied Science degree. Sterling Chow, one of the students in the class, said he and his classmates gathered GPS data, took detailed notes, and snapped pictures in order to compile enough information to create a map. “It’s a great learning tool, being out there, tying the information together, and accurately describing what you saw,” said Chow. The trail is on land owned by Pālamanui, LLC, which is the private development company planning a mixed-use community next to the campus. Preservation of the trail is part of the company’s cultural resource management plan. The GIS and GPS class’s excursion is just the latest example of college faculty using the trail as a classroom. Stevens has taken his writing and history students there, and the Hawai‘i CC – Pālamanui campus has plans to continue using it as an educational resource. On Wednesday, December 2, 2015 students at Hawai‘i Community College – Pālamanui demonstrated the knowledge they gained in their courses during the fall semester with performances, presentations, displays, and speeches. Family members, fellow students, and faculty attended the Hō‘ike, which was held at the new Hawai‘i Community College – Pālamanui campus in Kona. The International Education Committee would like to thank everyone who participated in International Education Week 2015. Special thanks to our International Fashion Show participants: Naifo Fuimaono, Desiree Agustin, Viliami Fahiua, Kano Fujiyama, Sun Mi Kim, Yonesia Paul and family. Special thanks to Kealiʻi Lilly for his weaving demonstration. Special thanks to our Intensive English Program students for their calligraphy demonstration. Special thanks to our cultural ambassadors: Karla Robles, Yui Isogai, and Medea Yankova for teaching us about their cultures. Special thanks to Chef Allan Okuda and our culinary students for a phenomenal international buffet. Special thanks to those who prepared cultural exhibitions for World Culture Night: The Mubahay Club, Meidor Hu, D’Anna Asher, Yonesia Paul, Pamela Scheffler, Sharon Dansereau and family, Mieko Yajima and Rieko Kawamura, and Carrie Mospens. Special thanks to the Fall 2015 Principles of Marketing Class for creating our International Display Window. There was a tie for the photo contest, and the winners were: DʻAnna Asher and Mieko Yajima. First place for the best dish contest went to the chicken marsala and runner up went to the vegetarian egg rolls. concerned about your health and safety! Free mosquito repellent will also be provided to participants. actively outdoors during your class times. University of Hawaiʻi Vice President for Community Colleges John Morton has recommended that Joni Onishi be appointed interim chancellor of Hawaiʻi Community College effective January 1, 2016. The Board of Regents personnel committee has also recommended Onishi’s appointment and the full Board of Regents will take up the final approval at its meeting on Thursday, November 19. Onishi is currently the vice chancellor for academic affairs at Hawaiʻi CC. 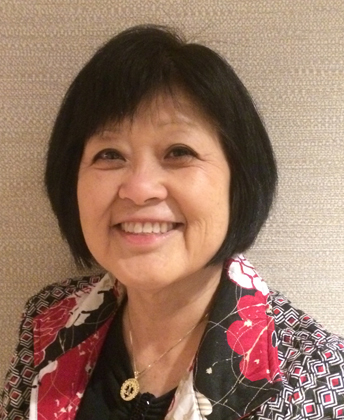 Onishi has been employed at Hawaiʻi CC since 1988 and is a tenured faculty member in business education. She has a bachelor’s degree in business administration from UH Hilo and master’s degree in education from UH Mānoa. Onishi was interim dean for career and technical education from 2007 to 2010 before becoming vice chancellor for academic affairs. As vice chancellor she has provided strong, consistent leadership in academic affairs. She has made substantial contributions to Hawaiʻi CC’s accreditation efforts, including playing a critical role in addressing recommendations from the Accrediting Commission for Community and Junior Colleges. A 19-member screening and interview committee has been appointed that includes Hawaiʻi Community College faculty, staff and administrators, as well as community members. The chancellor position will be prominently advertised nationwide. The committee will conduct the screening and interview process and submit a list of finalists to Morton. After a series of campus interviews and public forums with the finalists, the vice president will conduct his own review of candidates and present his recommendation to the Board of Regents. 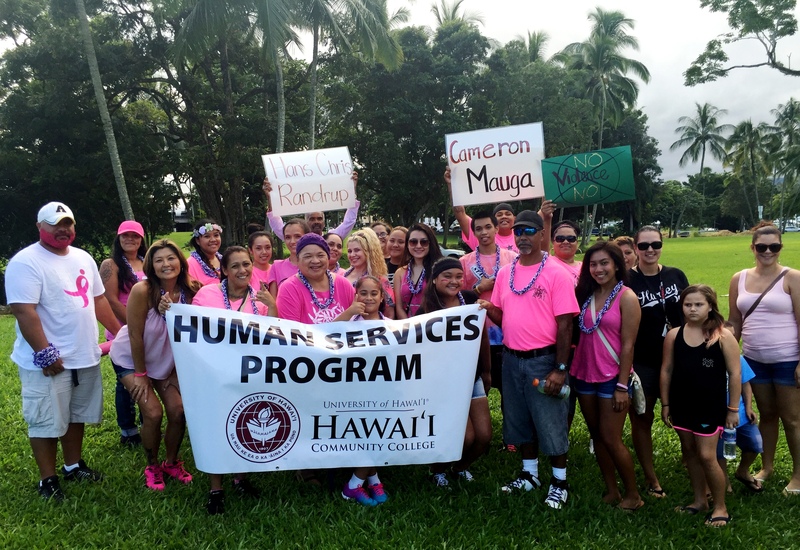 Hawai‘i Community College hosted its first-ever Express Admissions Day on Saturday, November 14, 2015. The event provided applicants an opportunity to visit the campus, apply for the Spring 2016 semester, receive their My UH Student Number the same day, and consult with Hawai‘i CC staff about the next steps in the enrollment process. Approximately 75 prospective students applied during Express Admissions Day in Hilo and the Hawai‘i CC – Pālamanui campus in Kona! Samantha Mowry, a student at Hawai‘i Community College, has been selected to receive a $1,000 scholarship from Phi Theta Kappa Honor Society as a 2015 Coca-Cola Leaders of Promise Scholar. Aunti Sandi with two of her Human Services graduates who became helpers by passing out the door prizes to the many attendees of the 75th Anniversary dinner on November 7th, 2015. 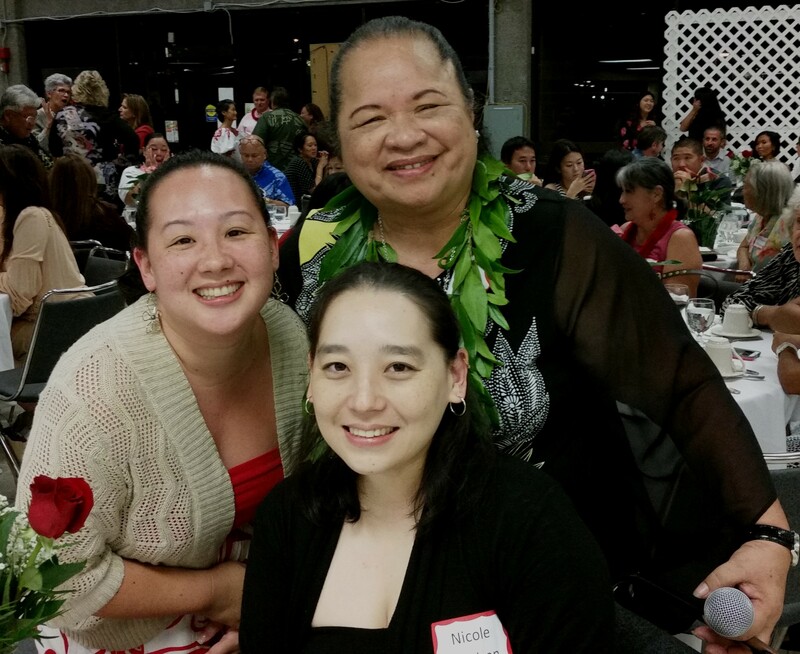 Pictured above are Courtney Harrison (left), who will be graduating with her Master’s in Social Work in May; Nicole Harrison (center), who is pursuing her Master’s in Education at UH Hilo; and Hawai‘i CC Assistant Professor, Sandra Claveria. 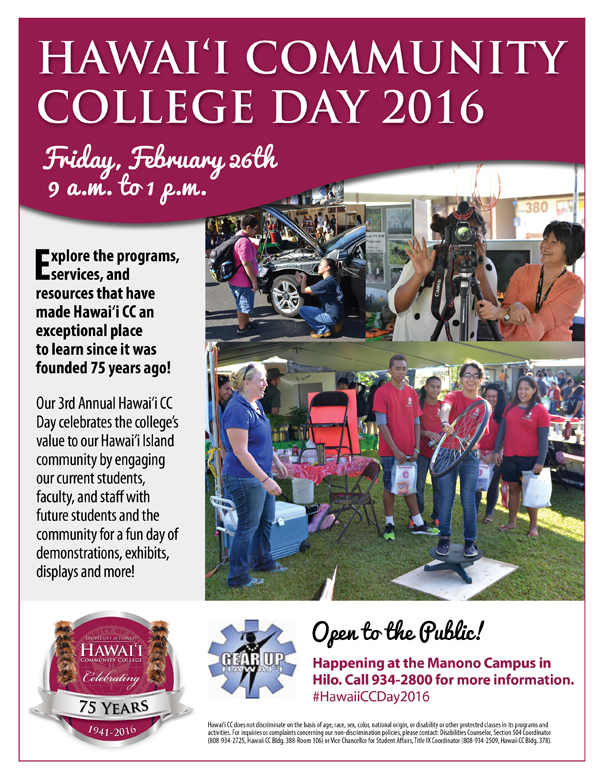 Congratulations, and mahalo for supporting Hawai‘i Community College’s 75th Anniversary! The Hawai‘i Food & Wine Festival has donated $10,000 from its annual culinary event at the Waikoloa to Hawai‘i Community College’s Culinary Arts program. The organization presented checks to Hawai‘i CC and the other recipients at an event held Tuesday, November 10 on O’ahu. This is the second consecutive year the Hawai‘i Food & Wine Festival has made a donation to the college. Mahalo for the support! Please see the following article from the Honolulu Star-Advertiser about the donations. This year’s Hawai‘i Food & Wine Festival, a two-week culinary gala in September, benefited 16 organizations with a total of $350,000. Checks were presented Tuesday at Neiman Marcus’ Mariposa Restaurant. The recipients were: Culinary Institute of the Pacific ($80,000), Hawai‘i Agricultural Foundation ($70,000), Imua Family Services ($50,000), Kapiolani Community College Culinary Arts Program ($30,000), Leeward Community College Culinary Arts Program ($25,000), Maui County Farm Bureau ($20,000), Hawaii Island Community College Culinary Arts Program ($10,000), Kapiolani Community College Hospitality and Tourism Program ($10,000), Paepae o He‘eia ($10,000), Papahana Kuaola ($10,000), Maui Culinary Academy ($7,500), Hawaii Seafood Council ($7,500), Honolulu Zoo Conservation Fund ($7,500), Aloha United Way Young Leaders Program ($5,000), Kako‘o ‘Oiwi ($5,000) and Hawaii Farm Bureau Federation ($2,500). Over the past five years, the fest has given more than $1.3 million to local beneficiaries. This year’s events featured 101 chefs, four master sommeliers, 35 top-tier winemakers and 16 mixologists. Students from the state’s various culinary programs worked alongside world-class chefs during events. More than 7,400 residents and visitors attended 21 events on Oahu, Maui and Hawaii island. The 2016 festival is scheduled for Oct. 14 to 30. Visit hawaiifoodandwinefestival.com. Members of the Hawaiʻi Community College ʻohana, including alumni, faculty, staff, students, and community members celebrated the college’s 75th anniversary on Saturday, November 7 while also raising money to support student scholarships. The Hawaiʻi CC Alumni & Friends Scholarship Fundraiser Dinner and 75th Anniversary Celebration attracted support from the community in the form of ticket sales and donations, and the proceeds will help students achieve their dreams of a college education. Approximately 200 people attended the event, and other community members made donations. Hawaiʻi CC Alumni & Friends will use the proceeds from the fundraiser to create an endowment fund that will perpetuate and accrue in value. Alumni & Friends exceeded their goal of raising $25,000 with the event. Read professor Anne Chung’s “Living Hilo Style” article about the event! 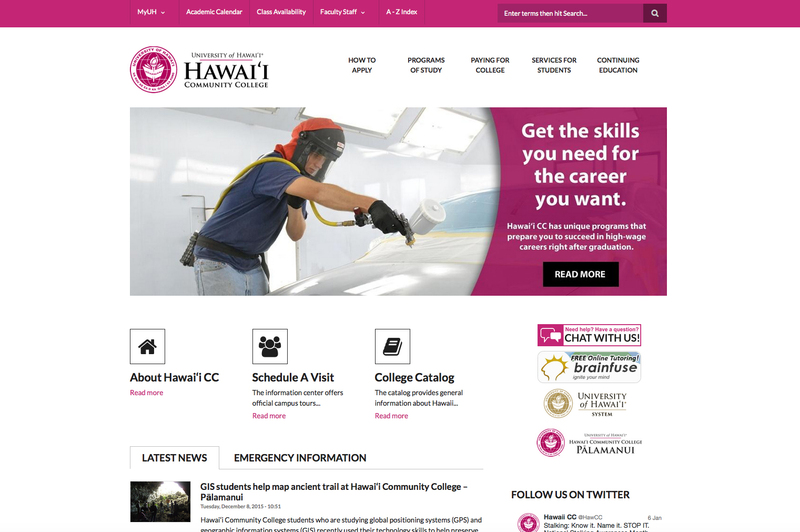 Hawaiʻi CC was founded in 1941 as the Hawaiʻi Vocational School with five trades programs and 183 students. The college has continually evolved to meet needs of employers and students, and Hawaiʻi CC now offers 26 academic programs and has more than 3,000 students enrolled in Hilo and at the new campus in Kona named Hawaiʻi Community College–Pālamanui. With programs such as natural science, auto mechanics and early childhood education, students can prepare to enter the workforce right after graduation or easily transfer to one of the other University of Hawaiʻi campuses, including the adjacent University of Hawaiʻi at Hilo. In the last 23 years alone Hawaiʻi CC has awarded more than 10,000 degrees and certificates, and in the last two years the college has awarded a higher number of degrees and certificates than ever before: 685 in 2014 and 643 in 2015. The fundraiser on Saturday featured speeches, a silent auction, a vintage fashion show and the recognition of an alumnus who enrolled the very first year the college opened in 1941. Hawaiʻi CC awarded Matthew Y.P. Chow an honorary certificate during the event. Chow, an 89-year-old Hilo resident, enrolled in the welding program from 1941-1943. He never received his certificate, however, because a curfew imposed from sunset to sunrise as a result of World War II prevented a commencement ceremony from taking place, he said. “It brings back a lot of memories, old time memories of my attendance at Hawai’i Vocational School back in 1941-43,” Chow said. With his welding skills, Chow worked for two years at the Pearl Harbor Naval Shipyard during World War II. After the war he obtained a bachelor’s degree in biology and worked for more than 20 years as a biology teacher at Hilo High School. 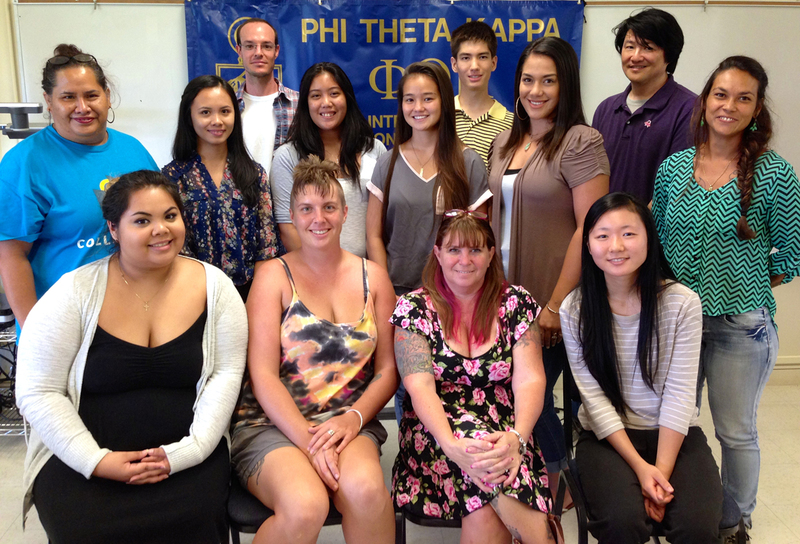 Phi Theta Kappa International Honor Society’s Alpha Psi Epsilon chapter in Hilo conducted its informal, Fall 2015 Induction. Chapter President Candace Wharton and Vice President of Membership Desiree DeCanto-Gardner presided over the event. Congratulations to the following inductees: Kaitlyn Ashida, Keoki Baily, Charles Bauguess, Andrea Cabigon, Sebastian Callerec, Keiran Cardoza, Aramina Cascayan, Joshua Coston, Christian Fisher, Lehua Garcia, Moana Gates, Jasmine Granadosin, Maile Hanaoka, Ashlee Hollingsworth, Lonica Iliwa’alani, Luana Jones, Renzy Richard Josue, Shenicia Kahakua, Jessica Kolish, Isaiah Lavea, Lynell Liborio, Dustin Mastandrea, Kaleo Matthews, Abraham Medeiros, Jr., Michelle Nason, Kayla Okimoto, Jillian Perreira, Lucienne Reddell, Nicole Saito, Shayne Shinkai, Tahigwa Summers, Kayla Tano, Madeline Taomia, Chezare Torres, Jaunalyn Vickers, and Calla Weddington. Chartered in 1993, Alpha Psi Epsilon and its members represent the top 10 percent of students enrolled at Hawai‘i Community College. Students must earn a 3.5 minimum, cumulative grade point average and 12 credits toward an associate’s degree prior to being invited by the Vice Chancellor for Student Affairs to join the society. Alpha Psi Epsilon members participate in year-round activities that promote the organization’s four hallmarks: scholarship, leadership, service and fellowship. Are you interested in pursuing a graduate education in social work? Did you know the University of Hawai‘i at Mānoa Master of Social Work (MSW) degree program is available in West Hawai‘i through distance education technology? Learn about the MSW program during an information session at Hawai‘i Community College Pālamanui in Kona on Wednesday, Nov. 18 from 5:30 – 6:30 p.m. The MSW Distance Education Option is a three-year program that includes classes delivered via interactive television, computer-based delivery, face-to-face onsite, and hybrid approaches, as well as completion of field practicum in your community. The MSW program is currently recruiting applicants for its new cohort to begin in Fall 2016. The deadline to apply is Feb. 1, 2016. For more information, attend the upcoming informational session on Wednesday, Nov. 18 presented by representatives from the UH Mānoa Myron B. Thompson School of Social Work. Anyone is welcome to attend; no RSVP necessary. Hawai‘i Community College – Palamanui is located at 73-1025 Kaiminani Drive in Kailua-Kona. For more information, visit our website at www.hawaii.edu/sswork/de or contact the MSW Distance Education Option at (808) 956-9470 or by email at sswde@hawaii.edu. You may also contact Carrie Kuwada Phipps, Educational Specialist, at (808)969-8808, carriekp@hawaii.edu. Express Admissions Day is the fast way to apply for the Spring 2016 semester. Prospective students can complete an application; receive their MyUH Student Number; schedule the next steps in the enrollment process, such as academic advising, orientation and placement testing; and have their questions answered by Hawai‘i CC representatives. The deadline to apply for the Spring 2016 semester is Dec. 1, and classes start on Jan. 11. Attendees of Express Admissions Day can enter to win a scholarship, and current Hawai‘i CC students who bring a friend can also enter to win a scholarship. For more information about Express Admissions Day please call the Hawai‘i CC Information Center at 934-2800 (Manono campus) or call the Hawai‘i CC – Pālamanui Student Services office at 969-8816. You can also visit hawaii.hawaii.edu for more information. Students from the Human Services Program, along with their families, take the time to walk in the Family Peace Walk Against Domestic Violence on Friday, October 30, 2015. 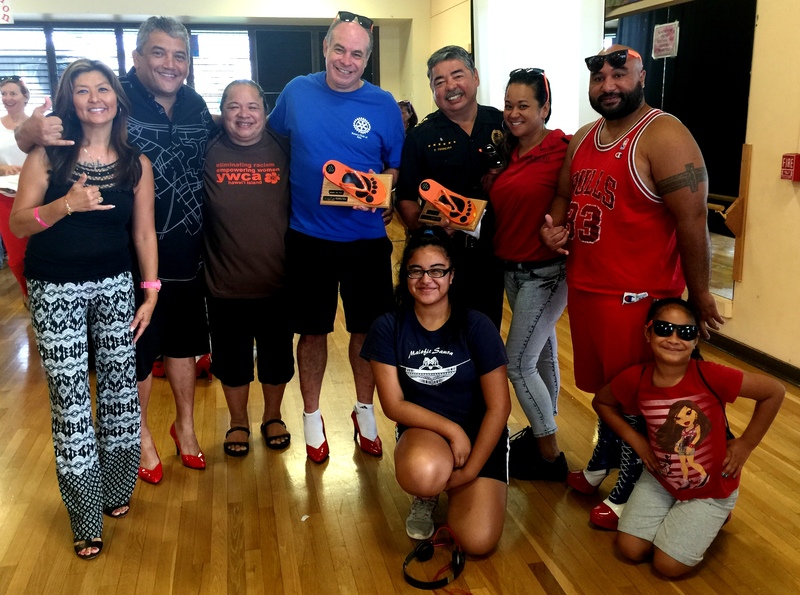 Others take the time out after setting up for the YWCA Walk a Mile in Her Shoes fundraiser for the Sexual Assault Program on Saturday, October 24, 2015, to get a picture with Mayor Billy Kenoi, Prosecuting Attorney Mitch Roth and the Chief of Police, Harry Kubojiri. 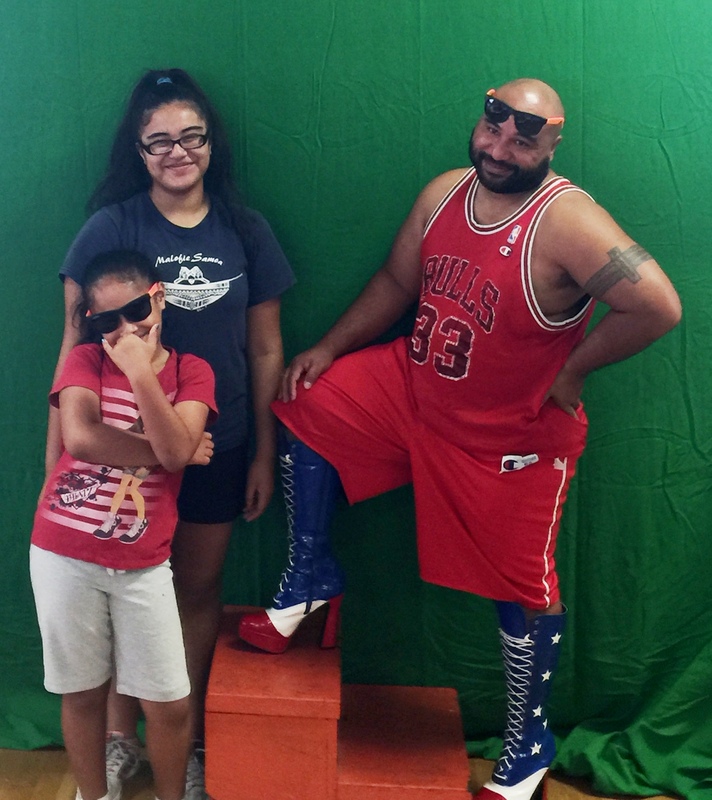 John Pearson, pictured with his daughters, proudly shows his patriotic side with the shoes he walked in for the YWCA Walk a Mile in Her Shoes Sexual Assault fundraiser held on October 24, 2015.
International Education Week is a national initiative sponsored by the U.S. Department of State and the U.S. Department of Education to celebrate diversity, promote cultural awareness, and foster the development of global citizens. Hawai‘i CC has participated since 2011. A display case with artifacts from around the world will be presented at the University of Hawai‘i at Hilo Business Building. International coffee talk with cultural ambassadors, 7:30 – 9:30 a.m. at the World Plaza behind the Kau Wa‘a Student Center. Cultural art demonstrations and exhibitions, 11 a.m. to 1 p.m. at the World Plaza behind the Kau Wa‘a Student Center. World Culture Night with international food, international fashion show, photo contest, best dish contest, and cultural exhibitions, 4 – 7 p.m. at the Hawai‘i CC Cafeteria. All events are free, and all students, faculty, staff and family members are invited. IEW is sponsored by the Hawai‘i CC Student Council and Student Life Program, the Honda International Opportunity Fund, and the University of Hawai‘i Foundation. Haʻakūmalae is the official orchestration of the Hawaiʻ i protocols leadership at Hawaiʻ i Community College and the University of Hawaiʻ i at Hilo. As an active member at our Hawaiʻi Community College and in the Hawaiʻi Island Community, there are many opportunities and events for engagement in these activities. Our HawCC Kauhale welcomed the Hawaii Community College Leadership Champions on Friday, September 11, 2015, at 9:00 am. The current and next generation of leaders representing all seven campuses and the UH system office were here for their monthly meeting. The mission of the University of Hawai’i Community Colleges Leadership Champions (CCLC) is to identify, encourage, develop, and support the next generation of community college leadership. The meeting was hosted by our campus and facilitated by KauaiCC Chancellor Helen Cox. The Wo Learning Champions arrived on our campus on Friday, September 18, 2015, at 10:00 am. The Wo Learning Champions initiative focuses on professional development for faculty and staff in Hawai‘i’s two-year institutions. The group visited with various programs on campus and as a group ventured on a guided experience of the wahi pana of Hilo. High school students, staff, & administration of Samuel Manaikalani Kamakau Public Charter School visited our campus on October 6th. The group spent time on campus visiting programs and spending time in one of the courses offered by Hawaiʻi Life Styles to get a taste of what the college experience is all about. They shared in the exchange of the kīpaepae and went home with new experiences and the affirmation that community and support can be found beyond their home institution. On Monday, October 12th, the Hachiman of Tsurugaoka Hachimangū of Kamakura, Japan visited our campus and participated in an exchange with our Kauhale & community thru the kīpaepae welina. As hosted by the college and the Hawaiʻi Life Styles Program the group conducted a workshop on Shinto practices, sharing a blessing, stories, flute playing & the temple Maidens’ dance. At the request of the office of Mayor Billy Kenoi, a kīpaepae welina was presented to open the Mayorʻs Health Fest and to help create a community consciousness in regards to the new Blue Zones Project. The Blue Zones Project works towards bringing together citizens, schools, employers, restaurants, grocery stores, and community leaders to improve community living environments so that healthy choices are easily identifiable and ultimately become socially commonplace. The Kīpaepae Hoʻonoho occurred this October for our newly renovated Hale Aloha and was attended by faculty, staff and students. This ceremony helped to mark the establishing of the residence of the Nursing & Allied Health Division into their home of Hale Aloha thru the ceremonial burying of the piko and symbolic planting of a lama tree on the premises. Forgotten Children of Maui: Filipino Myths, Tattoos, and Rituals of a Demigod. On Thursday he shared about the foundations of his practice of batek (tattoo) as it is done as ritual and presented a live demonstration of this application with tools that are handcrafted by him made of wood, horn, bone, and thorns. In recognition of the 75th Anniversary of Hawaiʻi Community College the annual Alumni dinner will begin with a kīpaepae welina and include a hōʻike featuring Unukupukupu. Haʻakūmalae-Unukupukupu participation in this event will include Faculty & Staff of both campuses (HawCC & UHH) as well as current & former students of the Hawaiʻi Life Styles Hula program. The International Congress on Coastal and Marine Tourism (CMT) returns to Hawaii 25 years after its inaugural meeting there in 1990. Unukupukupu has been invited to present the opening protocols for this event, a kīpaepae welina to establish the foundation for all organizations and participants attending. Led by the Kīpaepae Protocols Committee, Hawai‘i Community College held a Kīpaepae Ho‘onoho for the newly renovated Hale Aloha on Monday, October 19. The Hale Aloha dormitory was constructed in the late 1960s to provide housing for students attending Hawai‘i Community College and UH Hilo. Opening in 1969, the co-ed dorm was designed to house 32 male students on the 1st floor and 22 female students on the 2nd floor each academic year. After the closure of the Hale Aloha dormitory in Spring 1996, the building was converted to offices for various UH Hilo programs and departments. In September 2011, Hawai‘i Community College received funding to renovate the Hale Aloha Building for the Nursing & Allied Health Division. The building renovation includes offices for nursing faculty, two simulation labs, and a conference room on the 1st floor. The 2nd floor was remodeled to accommodate the Nursing Division Office, two nursing labs, and two classrooms. The renovation of the Hale Aloha building also includes a unique “green” rooftop on the third floor. The new open roof is available for students, faculty and staff at Hawai‘i Community College to enjoy. Hawai‘i Community College Culinary Arts students have been busy in Hilo and Kona the past few weeks working at major Hawai‘i Island culinary events: the Taste of Hilo and the Taste of the Hawaiian Range.